Right at the beginning of the last Retrograde phase that just ended in the beginning of December Mercury had dragged me down into the "underworld" of my hard-drive where all the dead and forgotten projects lie. He made me dig up an undertaking I had left abandoned over a year ago. The initial code was chaotic but served me well and it was never meant to be used by anyone else. Soon I had reached a dead end when trying to add features to it and in a spontaneous Martian mood I heroically decided to rewrite the whole thing from scratch and make it modular and extendable. But as with so many things in life, the Saturnian forces in me won by mere tenacity and I lost interest in rewriting the code and left an unfunctional wasteland of code fragments behind. Now suddenly Hermes Cthonios had kicked me hard and within several weeks of full-on total antisocial geek mode I collected all the rubble, sorted and rebuilt it into a modular structure, and almost on the minute of Mercury stationing back direct I leaned back from my computer screen and found myself looking at a finished project I dubbed "Sublunar Almanac". In a limited way it is possible to use the Sublunar Almanac offline. This is practical when you know that you will not have internet or when you want to calculate a larger range of days for a place and you don't want to wait for the lengthy calculation everytime you use it. When you have generated a roster it is possible to save the data by going back into the Settings and clicking on the newly appeared download button on the bottom left. Now simply leave the Sublunar Almanac open in you browser before you go offline or save it locally. Next time you want to regenerate the roster, simply open Settings and instead of providing location and time information as described in the Settings section above, click the Select File button on the bottom left and select the file you downloaded in the step explained in the previous paragraph. Now you can still select whether to Hide Past hours or use the Sidereal zodiac and which modules to use, but all other fields are ignored. Hit Generate and the roster is immediately generated without any necessary calculations. Sublunar Almanac is free to use and also published as open source under MIT License! If you find it useful and it helps you improve your enchantments, please be so kind and Buy Me a Coffee!. If you are interested in getting the App, please check this article. Donate: support me with a bit of Mercurial cash to keep me motivated: Buy Me a Coffee! definitions.actions is an array of arrays of objects. Each object is a descriptor of an operation or phenomenon the module can display or filter according to information it gets from Sublunar Almanac. The id should be a unique number inside the module, action is a descriptive string of the operation or phenomenon, tags a space delimited list of tags associated with the operation or phenomenon. Optionally you can define hide either with info which will keep this phenomenon or operation hidden from the information window that appears when clicking on the planetary hour but visible in the filter lists, or filter which hides it from the filter lists but displays it in the information window. definitions.calculate is the main function that calculates and relates the property object received from the previous function with any data of the whole definitions object itself (mainly for actions). It should return an single dimension array of objects defined in the actions part of the module. definitions.group.id unique identifier of the group. All modules belonging to the group should share the same id. 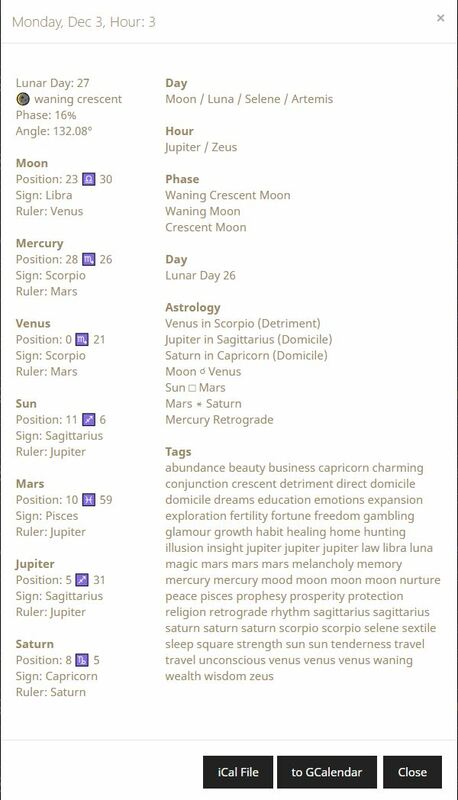 Notes: you can see that this module has the id "moon" and the name "Moon Sign", it is a core module and enabled by default in the Settings, it belongs to a whole group of modules called "Astrology". 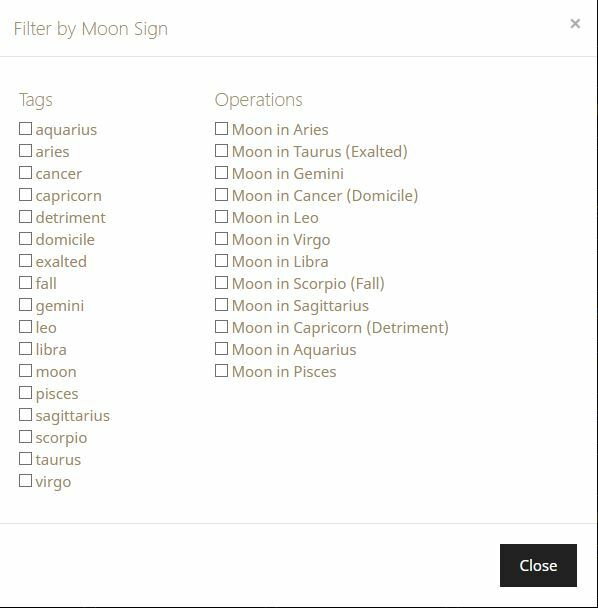 The actions are sorted by Zodiac sign and only the ones that show the moon in a sign where she is in domicile/exalted/detriment/fall should be displayed in the info window, all others are hidden, yet still visible in the filter window. The property function takes the ephemeris.moon.deg degree and passes it to a public function SL.Astro.Logy.getZodiac (described below) and returns the result. 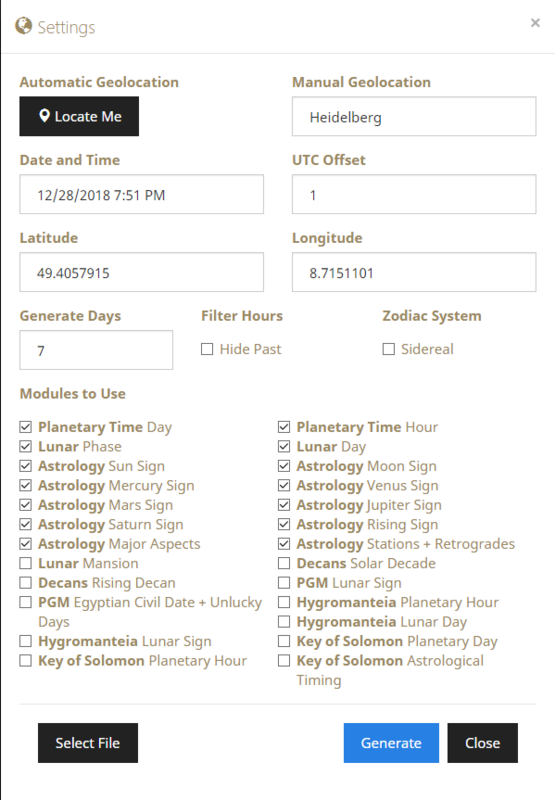 The calculate function takes the result object, takes the sign property ( 1 to 12 in the Zodiac ) and returns the appropriate object array from definitions.actions back to the Almanac.